Cyberpower PC has been showing off a ridiculous machine at CES 2017 which actually has two PCs inside one case. One of them is a beefy gaming system, and underneath that is a mini-ITX machine built for streaming. The Hyper Liquid Series Prostreamer II is a little too much for all but the most serious of live streamers and YouTubers, but impressive nonetheless. 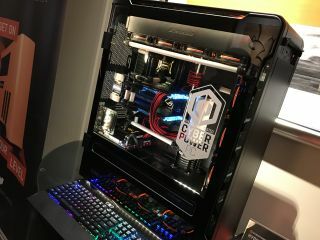 Prices start at $2,999 based on how you want to customize your rig, but the one Cyberpower PC was showing at CES will run you around $6,000. The main ATX gaming system has an Asus ROG Rampage V Edition (Intel X99) motherboard, with an Intel Core i7 6950X 10-core processor. As for the graphics card, there's not one, but two MSI GeForce GTX 1080 Gaming X 8GB cards, along with 64GB of RAM running at 3200MHz. A 512GB Samsung 950 Pro SSD NVMe provides the storage, and a Corsair AX 1500i power supply keeps everything running. As for the streaming setup in the bottom of the case, it's a mini-ITX build with a Z270i Gaming Pro Carbon AC motherboard, an Intel Core i3-7350K CPU at 4.2Ghz, it has 16GB of the same RAM, an Avermedia Live Gamer HD 1080p capture card, and a Coolermaster G650M power supply. The case housing these two builds is the giant Phanteks Enthoo Elite Ultra, which costs more than most people's PCs without anything in it. This is a seriously monster PC, and as you can see from the images, inside it's a beautiful thing to look at too. Cyberpower PC's custom Hyper Liquid cooling system keeps the heat down, and it comes with your choice of liquid and RGB strip lighting to suit your tastes.